Gilbert Stuart, George Washington (The Athenaeum Portrait), 1796, oil on canvas, 48 x 37 inches. National Portrait Gallery, Smithsonian Institution; owned jointly with Museum of Fine Arts, Boston. 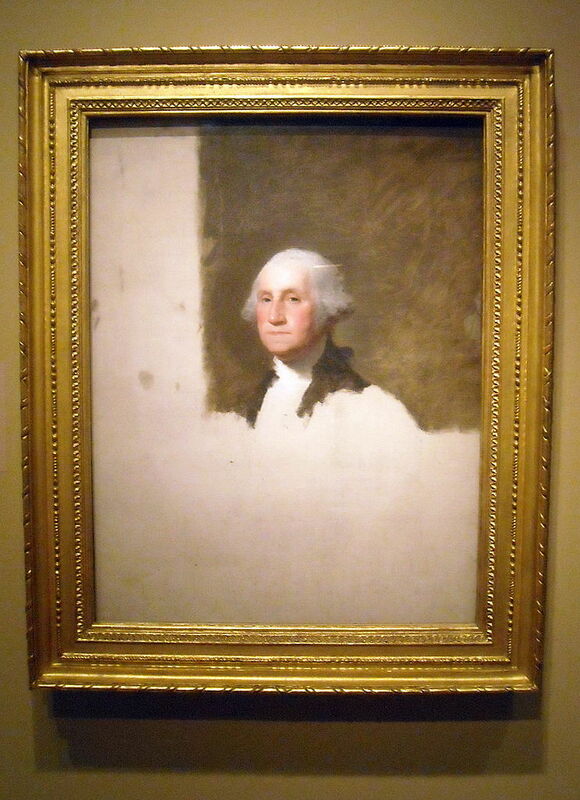 From the label text at the National Portrait Gallery in Washington, DC: American artist Gilbert Stuart was commissioned to paint this portrait after the success of his first portrait of Washington in 1795. Martha Washington convinced the president to sit again because, according to artist Rembrandt Peale, she “wished a Portrait for herself; he therefore consented on the express condition that when finished it should be hers.” Stuart, however, preferred this portrait to his earlier Washington; he purposely left it—and that of the first lady—unfinished so that he could use it as a model for the numerous copies that the first president’s admirers commissioned. After Stuart’s death, the two paintings were purchased for the Boston Athenaeum, which owned them for more than 150 years. –William Tyler Page, written in 1917, accepted by the United States House of Representatives on April 3, 1918. Well…I for one do so hope the current presidency will be an unfinished one.